The icy roads caused several accidents and vehicles in ditches Monday morning, including a Bond County Transit Bus and small passenger car that collided head-on just after 9:00 a.m. Monday on Woburn Road. The accident happened near the Greenville Country Club just past the bend in the road on Woburn. According to police responding to the scene the driver of the car was taken to Greenville Regional Hospital by ambulance for evaluation but injuries were not believed to be severe. 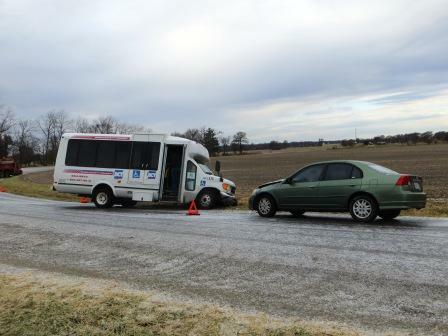 The transit bus was empty at the time of the accident, except for the driver who was not hurt. While police responded to this accident, just down the road on Woburn, the front tire of a truck spreading salt left the roadway to the right and got stuck on the turn. The conditions on Woburn road made it almost impassable at points with ice completely covering the road. 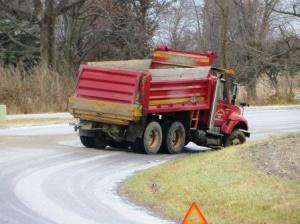 As of about 11:00 a.m. Monday, Greenville Police had responded to eight different accidents due to the icy roads. Around 7:31 a.m. a truck on I-70 struck the guardrail and overturned near the 46 mile marker. 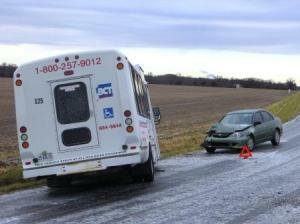 There were at least 3 other accidents on I-70; most were cars in ditches with no injuries. Another vehicle flipped at the intersection of Rt. 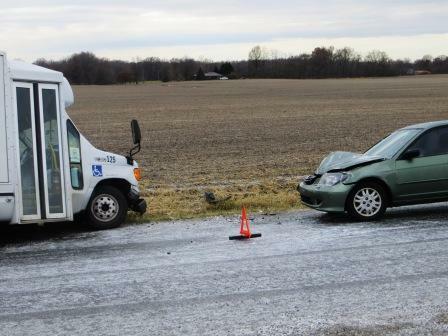 140 and 160; there was no word on injuries from that accident at news time. Accidents were also reported on Pokey Road around 7:00 a.m., Bauman and Pokey Road around 8:00 a.m., and Idler and Route 140 at 9:43 a.m. Please remember to drive carefully today! We’d like to send a big “thank you” to the police and first responders who are out working in these conditions.